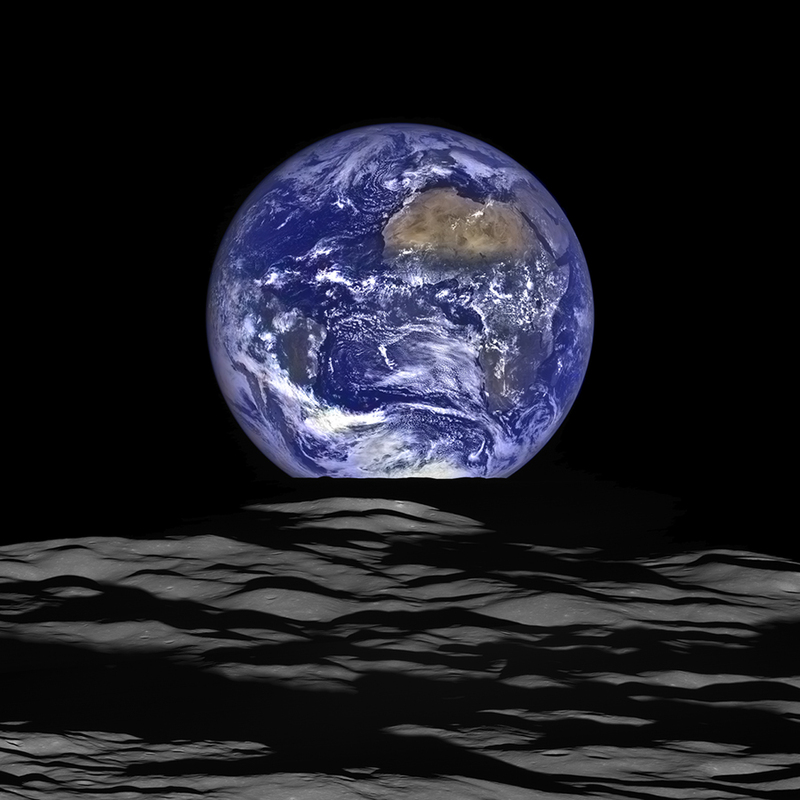 Is This New Picture of Earth From the Moon for Real? Yes, Yes It Is. Today NASA released an amazing image of Earth taken from the Moon — specifically from lunar orbit by NASA’s Lunar Reconnaissance Orbiter, which has been studying our Moon since the summer of 2009. In it our planet appears as an incredibly bright blue globe with swashes of white clouds and Africa and northeastern South America clearly visible beyond the rolling grey hills of the Moon. It’s so clear and perfect it almost doesn’t look real — so is it? Also the whole way that LROC’s narrow-angle camera obtains image data is not like a point-and-shoot camera; it’s a line scanner that takes “sweeps” as the spacecraft is in motion, which makes it necessary to adjust for distortion. And the color data came from the wide-angle camera — a different instrument entirely. So is the image real? Yes. Was it “manipulated?” Yes. But basically so are all photographic images, since they all require machinery or a device of some sort to create an image that your eyes and brain can experience. Cameras aren’t brains, and eyes aren’t cameras — some amount of handiwork is always needed (sometimes more than others!) But the view was there, and thanks to the LROC team we get to see it. By the way if you really want to knock your socks off, check out a super-high resolution color version here (big file). The very first image of Earth from the Moon was captured in August 1966 by NASA’s Lunar Orbiter I, and then more famously on Dec. 24, 1968 by the crew of Apollo 8. Of course, being tidally locked, from any one spot on the Moon the Earth doesn’t ever “rise” — it always remains in more or less the same location (where it’s visible at all.) But it does appear to rotate, and will also go through phases like the Moon does from Earth. A “rising” effect is only witnessed from spacecraft in lunar orbit. Learn more about how this image was made on the LROC site here. Next Post Cassini Has Made Its Last Pass by Enceladus. Here Are the Pictures. not real. look at the bottom of the earth. as in the pics that NASA claim are from the surface of the moon the shadow should be a smaller radius. like the half moon shadowed by the earth there is a rounded shadow from a larger object on a smaller object. we should be seeing the opposite shadow from a smaller object on a larger object. The shadow should be a smaller radius than we see an the moon. FAKE TO THE MAX !!!!!!! In my humble opinion. hahahhahhahah. There isn’t any shadow on the Earth here, it’s in essence a “full Earth.” The dark shadowing is lunar mountains silhouetted in the distance blocking part of the Earth. Look at the bottom edge. The only thing between the sun and the earth to block out any part of the “full earth” is the moon. We would see a dark radius not a flat squiggly line. This is not for you D Rooney, because you are an idiot, and will always be. But I’ll explain for other readers: Picture is from low lunar orbit, where the moon’s limb seems relatively flat, except from the mountains. In addition, it is taken with a telephoto lens, so you only see a small part of the moon’s limb. Even you were farther from the moon and saw a prominent radius, it would not be very noticeable on a narrow angle picture like this. I thank you for your useful comments. Now if you are not to busy you should go to your mother’s house and have intercoorse with her while the adults are conversing. Then take a pic of the moon. you will see no shadows of mountains cast on it and you will see a full moon or one with a radius from the shape of the object making it. It’s exactly like the phases of the moon. Complete idiocy confirmed. Thanks a lot. A camera can’t resolve a several-meter-wide satellite orbiting Earth from the vicinity of the Moon. Even the ISS, which is 110 meters wide, isn’t visible at that resolution. Computers were involved as much as computers are involved in any image that is received from spacecraft and processed for final release. But the data itself was from LRO’s cameras, not “generated” by a computer.